Mid-week meals just got a lot easier with this Coconut Lentil Curry Prawns from Melanie Lionello(@naturallynutritious). You know these kind of days when you’re full of goodwill and want to cook a nice dinner? Then you read a recipe, scrolling down the page and shake your head asking “who has the time to make that?” These kind of days when you want dinner NOW? Like walk through the door and have it ready on the kitchen bench. Instead, you often find yourself relying on take-away or toasties… (we all do it). We have been collaborating with Melanie Lionello to create our tasty Coconut Lentil. A soup based on South India’s staple lentil koottu, which includes both lentils and nutrient-rich mung beans, as well as capsicum and sweet potato to give it a slightly sweet taste that sets off the spices very nicely. Melanie already developed two recipes using the Coconut Lentil. A Chicken Skewers on Naan Bread (she has the desire to share and create for people she loves, using real kumera, lentils, capsicum and mung beans all heightened and united by a traditional mix of Indian spices) and a Baked Jacket potato with pomegranate (a delicious and nourishing ‘go for’ if you are in lack of inspiration). We let you judge by yourself. 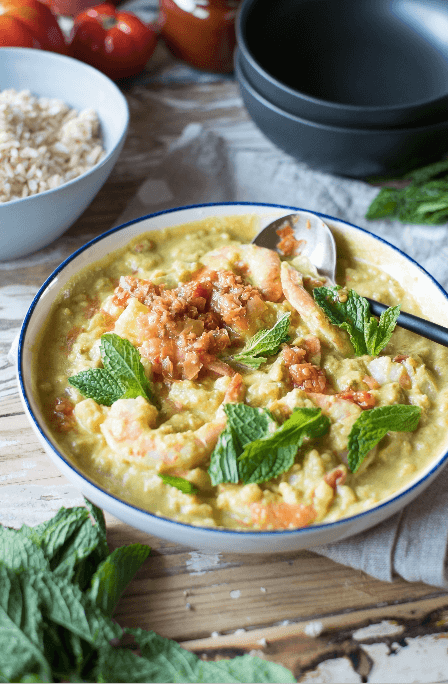 For this new recipe, Melanie decided to mix the sooth and super flavourful Coconut Lentil with some tangy pineapple and juicy prawns. Dinner ready in just 10 minutes! Place soup into a pot and heat on medium until simmering. Add coriander and pineapple. Cook for 5 minutes, stirring occasionally. Add prawns and cook until they have turned orange on both sides. Serve hot in a bowl with brown rice, a spoonful of chilli sambal and mint to garnish.